Microsoft has announced seven different versions of its Windows 10 in an official Windows blog post. Departing from the practice during Windows Vista and Windows 7 era where there are tons of confusing editions for consumer to choose from, the editions for Windows 10 are much simplified and most users will have only one or two choices to consider for each class of device, like what’s offering in Windows 8 and Windows 8.1. What’s new is that Windows 10 is now also the name of Windows operating system meant for smartphones, phablets and mini-tablets, which previously was known as Windows Phone. Not only that, Windows 10 will also power an incredibly broad range of devices, including Xbox One, Microsoft HoloLens, Surface Hub, and it’s also the OS for IoT (Internet of Things), which also share the same Windows 10 name. With Windows 10 as the only one product family, one platform and one universal Windows Store, in reality, not all Windows 10 editions will be able to use on all hardware. In fact, with so much hardware to support, we’re expecting to see many tailored Windows 10 versions for specific devices. The following list includes both the officially announced Windows 10 editions, and possible Windows 10 SKU (Stock Keeping Units) from the Microsoft’s announcement so far, though you won’t be able to buy some of them on the market, as they’re meant for OEM and hardware partners to include in end retail products. 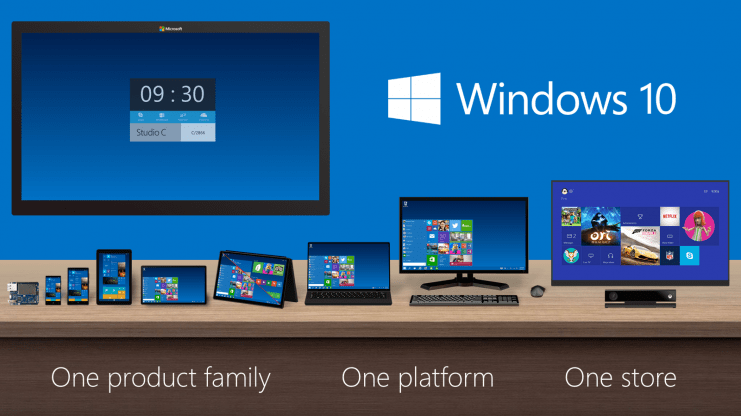 Windows 10 Home: The consumer-focused desktop edition. It offers a familiar and personal experience for PCs, tablets and 2-in-1s. With it, they will be more productive and have more fun thanks to a long list of new innovations: Cortana, the world’s most personal digital assistant; the new Microsoft Edge web browser; Continuum tablet mode for touch-capable devices; Windows Hello face-recognition, iris and fingerprint login; and right out of the box, a broad range of universal Windows apps like Photos, Maps, Mail, Calendar, Music and Video. Another feature would be games and gamers can access to the Xbox Live gaming community, enabling the capture and share of gameplay and giving Xbox One owners the ability to play their Xbox One games from any Windows 10 PC in their home. Windows 10 Pro: Desktop edition for PCs, tablets and 2-in-1s. Building upon both the familiar and innovative features of Windows 10 Home, it has many extra features to meet the diverse needs of small businesses. Windows 10 Pro helps to effectively and efficiently manage their devices and apps, protect their sensitive business data, support remote and mobile productivity scenarios and take advantage of cloud technologies. Windows 10 Pro devices are a great choice for organizations supporting Choose Your Own Device (CYOD) programs and prosumer customers. Windows 10 Pro also lets customers take advantage of the new Windows Update for Business, which will reduce management costs, provide controls over update deployment, offer quicker access to security updates and provide access to the latest innovation from Microsoft on an ongoing basis. Also include is ability to join Active Directory (AD) domain. Windows 10 Mobile: Designed to deliver the best user experience on smaller, mobile, touch-centric devices like smartphones and small tablets. It boasts the same, new universal Windows apps that are included in Windows 10 Home, as well as the new touch-optimized version of Office. Windows 10 Mobile offers great productivity, security and management capabilities for customers who use their personal devices at work. In addition, Windows 10 Mobile will enable some new devices to take advantage of Continuum for phone, so people can use their phone like a PC when connected to a larger screen. Windows 10 Enterprise: Built on Windows 10 Pro, adding advanced features designed to meet the demands of medium and large sized organizations. It provides advanced capabilities to help protect against the ever-growing range of modern security threats targeted at devices, identities, applications and sensitive company information. Windows 10 Enterprise also supports the broadest range of options for operating system deployment and comprehensive device and app management. It will be available to Volume Licensing customers to take advantage of the latest innovation and security updates on an ongoing basis. At the same time, they will be able to choose the pace at which they adopt new technology, including the option to use the new Windows Update for Business. With Windows 10, Enterprise customers will also have access to the Long Term Servicing Branch as a deployment option for their mission critical devices and environments. And as with prior versions of Windows, Active Software Assurance customers in Volume Licensing can upgrade to Windows 10 Enterprise as part of their existing Software Assurance benefits. Windows 10 Pro Education: Built on Windows 10 Enterprise, and is designed to meet the needs of schools – staff, administrators, teachers and students. This edition is available through OEM channel and academic Volume Licensing. Windows 10 Education: Built on Windows 10 Enterprise, and is designed to meet the needs of schools – staff, administrators, teachers and students. This edition will be available through academic Volume Licensing, and there will be paths for schools and students using Windows 10 Home and Windows 10 Pro devices to upgrade to Windows 10 Education. Windows 10 Mobile Enterprise: Designed to deliver the best customer experience to business customers on smartphones and small tablets. It will be available to our Volume Licensing customers. It offers the great productivity, security and mobile device management capabilities that Windows 10 Mobile provides, and adds flexible ways for businesses to manage updates. In addition, Windows 10 Mobile Enterprise will incorporate the latest security and innovation features as soon as they are available. Windows 10 IoT Enterprise (formerly Windows Embedded Industry): Successor to Embedded Industry and Embedded Standard with plain unlabeled, retail client, thin client, tablet, and small tablet versions. Windows 10 IoT Mobile Enterprise (formerly Windows Embedded Handheld): For industry devices like ATMs, retail point of sale (PoS), handheld terminals and industrial robotics. Windows 10 IoT Core: Replacement for Windows Embedded Compact, meant for small footprint, low cost devices like gateways and embedded devices such as Raspberry Pi 2 and Intel’s Galileo board. Windows 10 IoT Core Pro: Provides the ability to defer updates and control distribution of updates through Windows Server Update Services. Another unknown is the Windows 10 equivalent for Windows 8.1 with Bing, which is free for OEM to include on small tablets. In Windows 8 and Windows 8.1, a total of four main SKUs or editions are available, namely Windows 8, Windows 8 Pro, Windows RT, and Windows 8 Enterprise. Microsoft has previously announced that the qualifying Windows 7, Windows 8.1 and Windows Phone 8.1 devices can upgrade to full versions of Windows 10 Home, Windows 10 Mobile and Windows 10 Pro for free within the first year after launch. Once you upgrade, you have Windows 10 for free on that device. Windows 10 is expected to be released in summer 2015.